Failed to rip some DVDs such as new movies? The article will help you fix such DVD rip and copy errors. I set about getting my DVD collection to my NAS box. I've ripped nearly 400 DVDs flawlessly to my NAS from my laptop. But recently I started getting an error when trying to rip some new movie DVDs. First Man, Mission: Impossible - Fallout, Widows, Bohemian Rhapsody… are all new and popular DVDs that are well rated in rottentomatoes.com. But when dealing with some of those commercial discs, most transcoders will go wrong. There often crop up failure of main title conversion, crash, disc loading errors, incomplete movie encoding (for example, HandBrake rips only half of a DVD or even only the first 30 seconds). Why Some New Movies on DVDs Are Hard to Decrypt and Rip? "Techie" users would understand that different types of discs may apply different encryption mechanisms. Generally speaking, most powerful DVD copy programs in the market can deal with simple and direct region code encryptions inclusive of CSS and RCE. However, even a good enough software can't vouch for 100% conquest of all types of DVDs. 1. Cannot Transcode New DVDs with HandBrake - How to Fix? - I used HandBrake to rip my DVDs. But since version 0.9.2, it was no longer able to deal with new copy-protected DVDs, although might have some luck in slight number of CSS types. Old Solution: Download and install libdvdcss.pkg (for Mac) / libdvdcss.dll (for Windows) to use in collaboration with HandBrake can help remove some types of encryptions. But Libdvdcss was removed from HandBrake DVD ripper since version 0.9.2. Users have to download it from third-party websites. Here are the download links for Windows OS. 1. HandBrake Libdvdcss cannot deal with Blu-rays, as well as some DVDs with complex encryption algorithm. 2. HandBrake is slow in scanning DVD titles, decoding and decrypting, although the encoding process is fast. New Solution: Turn to a DVD ripper that is built in with DVD decrypter. No other plug-in is needed. 2. Cannot Rip 99-Title DVDs - How to Fix? 99 title protections are widely used in Japan AV DVDs, America's workout DVDs, for example, Beach Boy's Insanity and P90X3 DVDs, a bit of Disney DVDs. If the conversion software you're using fails to choose the correct main title, skips parts of the movies, gets stuck or crashes in a loop, or if the output file shows in a gigantically 40GB file size, gets scrambled in wrong order or audio/video tracks, you extremely likely have met with DVDs that have 99 titles. 3. Cannot Rip Disney Movie DVDs - How to Fix? Among all types of DVDs, Disney movie DVD is the most knotty one. It always comes with DRM, newest generation DVD copy protection, Disney's Fake, etc. Most DVD rippers are not powerful enough to bypass the barrier. These are the hardest ones with something in common. It is not the encryption technique causes the difficulty, but the special format embedded in. The good news is that Digiarty Software comes cover the support of all DVDs above and fix all DVD rip errors at a short time when it becomes a truly unique DVD conqueror. Try the verty latest version of WinX DVD Ripper Platinum - the most stable and strongest for new, 99-title, AV, Workout DVDs. It cracks Disney X-project DRM, Sony ARccOS, UOPs, APS, CPRM and Cinavia copy protections, as well as Filesystems (Dummy files) for personal movie backup. "I have an extremely scratched DVD. This bad condition was my reason to try to rip it to preserve the contents as a file. And I did succeed to get a usable copy of the contents of the DVD in a file." - from a user of WinX DVD Ripper Platinum. 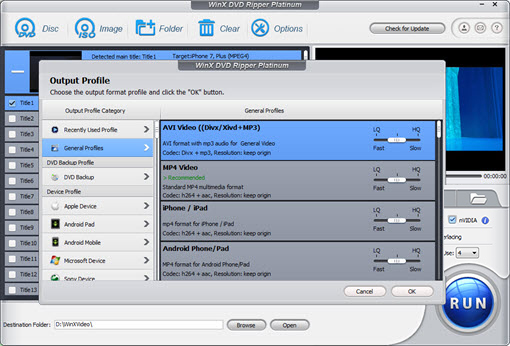 To make backup of DVDs without DVD loading, data reading or copy protection error codes, you need to download the WinX DVD Ripper Platinum. It is fastest in the planet, particularly in DVD copy mode. Unlike others, it is seamlessly compatible with the newest operating system versions such as Windows 10 and Macos High Sierra. install this fast DVD decrypter on your computer and launch it. Please check the latest version since it might get updated to support more DVDs. 2. Import the source DVD. Insert the source DVD into your DVD-ROM, and click "DVD Disc" symbol for content reading and loading. If you have a DVD folder or image file, you can choose "Folder" or "ISO Image". Then the software will auto analyze and check the main title for you, but you can correct the title number manually just in case. 3. Select an output format. Choose an output format item among the 350+ ready-made profiles. It depends on what you want the target digital file to be played on. The options range from common video formats to device formats for iPhone, Apple TV, iPad Air, Android smartphones, tablets, Surface and game consoles. 4. Check "Safe Mode" or not. "Safe Mode" would possibly make the DVD ripping process smooth. It can frequently be an inerrable option for DVDs distributed by Disney. But it will take more time than normal mode. 5. Define an output place. On the left bottom, you can browse to change the "Destination Folder" on your computer to save the output movie file. Just click the RUN button and start ripping the DVD to the digital file in the format you like without error with 32x faster speed and no quality loss. Afterwards, you can get a copied content on your hard drive that you can transfer to iPhone iPad and played flexibly. Till now, dozens of DVD copy protections have emerged, such as Content Scramble System (CSS), Region Code Enhanced (RCE), User Operation Prohibition (UOP), Sony ARccOS DVD protection, the Analog Protection System, etc. Part 1Why Some New Movies on DVDs Are Hard to Decrypt and Rip? Part 2Guide: How to Fix DVD Copy Errors?